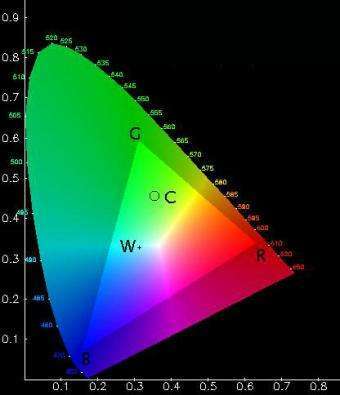 RGB gamut. The oval-shaped region represents the entire color space that human eyes can perceive, with the "pure," or spectral, colors on its boundary. Inside, the triangle represents the color space that can be reproduced by mixing red, green, and blue, with the three fundamental colors at its vertices. Since this image is itself encoded in the RGB channels, the colors outside the triangle are not faithfully reproduced. Displays based on diffraction gratings could instead faithfully reproduce the entire gamut of visible colors. Scientists have unveiled a new technology that could lead to video displays that faithfully reproduce a fuller range of colors than current models, giving such a life-like viewing experience that it could be hard to go back to your old TV. The invention, based on fine-tuning light using microscopic artificial muscles, could turn into competitively priced consumer products in eight years, the scientists say. The research appears online in Optics Letters, a journal of the Optical Society of America, and will also be published in the September 1 print issue of the journal. Tunable diffraction grating. The vertical membrane is made of artificial muscle, and has carbon electrodes attached to its sides. The membrane has one side molded into a diffraction grating and coated with gold to increase reflectivity. As the applied voltage varies, so does the periodicity of the diffraction grating, changing the angle of the diffracted light.